RUSH: Now, I want to continue here, all the things the media is not reporting because they are things that people who voted for Trump are very aware of and know. And it’s why Trump’s support is not evaporating, it is not dwindling, and large reason for that is Trump’s continual tweeting, Trump’s continual responding to the attacks, these incessant attacks. They are crucially necessary, and he continues. But one of the stories that really is big out there that the Drive-Bys are not touching is the great job the new governor of Florida is doing, Ron DeSantis. He’s got an approval number already north of 60. I was looking, it was two or three weeks ago and I saw 64% approval number in one poll. Now, DeSantis was in a neck-and-neck race with the Democrat Andrew Gillum, and to see an approval rating this high — And I tell you what, DeSantis has hit the ground running, implementing all kinds of campaign promises. He is executing and implementing a tremendous amount of his conservative agenda that he ran on. And his approval number here is through the roof. And I will guarantee that you if a Democrat governor in Florida was getting this kind of approval numbers, he would be on the Drive-By Media every other day weighing in on things. 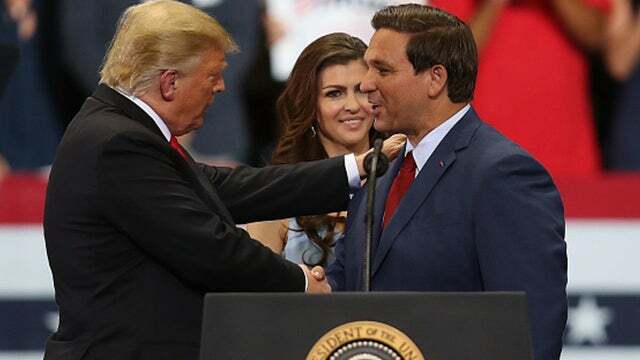 DeSantis is being ignored. Some of the Democrat candidates, some of the things that they are talking — this is insane. They want to add to the Supreme Court and pack it, six more justices. They want to get rid of the Electoral College. This is Fauxcahontas. Fauxcahontas wants to join this effort to get rid of the Electoral College. State of Colorado is making a move now to simply award all of their electoral votes to whoever wins the popular vote. The left cannot win without cheating. They can’t win without trying to change the Constitution. They cannot win with normal circumstances and rules applied fairly to both parties. They’re now trying to keep Trump off the ballot in certain states unless he releases his tax returns! There’s this new candidate — have you heard the name Andrew Yang? You haven’t, have you? 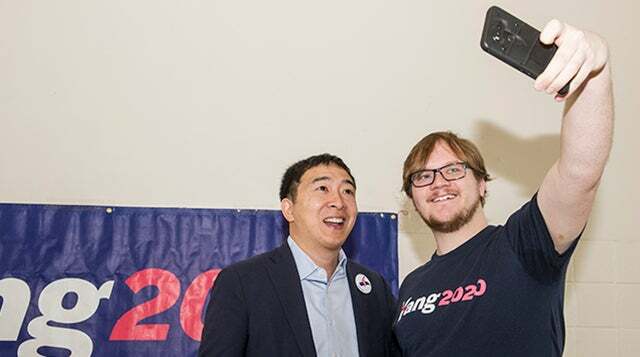 Well, Andrew Yang is now in the top tier of Democrat presidential candidates. You know why? ‘Cause he had a rally in San Francisco and he drew 3,000 people. And his big deal is a guaranteed national income. He wants to give everybody a thousand dollars a month. He’s some kind of tech Lord. I was not familiar with who he was before he got this notice. But he is attracting supposedly all kinds of attention among Millennials. Millennials supposedly love this guy. Andrew Yang. You know what else he believes? He wants to end circumcision. I mean, what kind of life ambition do you have to say your cause is eliminating circumcision? I would love to have that guy answer the question. It amazes me what people end up doing and what they want to do. Anyway, it’s a fundraising group, and they (sigh) kind of lurk in the shadows out there. But this guy, this is part of his presidential campaign, and he is attracting some attention. He got himself in the first liberal Democrat presidential debate that’s scheduled to happen in June. Pelosi is trying to lower the voting age to 16. They are doing everything they can to keep the border open and flood this country with people who are gonna outnumber and outvote you. Now, this is what the Drive-By Media is reporting. Amidst all of this, the things that Trump has implemented policy on, particularly the economy, are working like a dream — and none of it is being reported. None of it’s being touted. 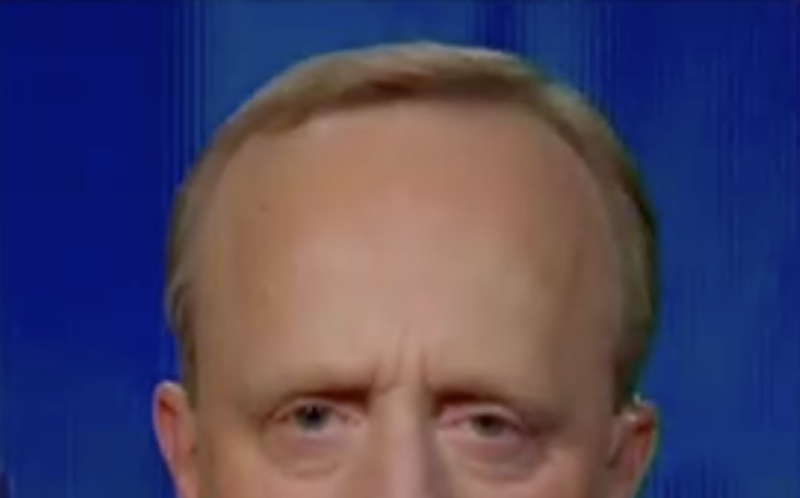 In fact, CNN is having a really, really bad week because of all of this — and I’m gonna play sound bites here in a second to show you. But let me give you an idea. Now, if you stop and look… I guarantee you that most people are gonna have some form of dyslexia reading this. They’re not gonna see “disapproval.” They’re gonna see “Trump’s Approval Rating Slides to Lowest of President.” This headline is written purposely to confuse readers and to make them think that the news that’s coming in this story about Trump is negative, when in fact it’s actually good news! Trump’s disapproval rating is the lowest of his presidency, meaning Trump’s negatives are the lowest they have been in two years! All of this is written — disapproval, unhappiness — with all these negatives. The news is excellent! The news is good! The trend is good! And they’re writing this and characterizing it so that people interpret it negatively. This is just another reason why you need me interpreting this and blowing this effort to smithereens, because this is constant, this effort to report negative news that doesn’t exist. RUSH: I shared with you the CNN poll. “Trump’s Disapproval Rating Slides to Lowest of Presidency.” That headline is meant to be misunderstood. Nobody does headlines about disapproval. Every news story about presidential ratings is about approval. So this headline is designed to make the reader think that Trump’s popularity is declining when in fact it’s increasing. It is going up. So rather than report Trump’s approval ratings climb in CNN poll, the headline: “Trump’s Disapproval Rating Slides to Lowest of Presidency.” You know what they’re trying to concoct there. 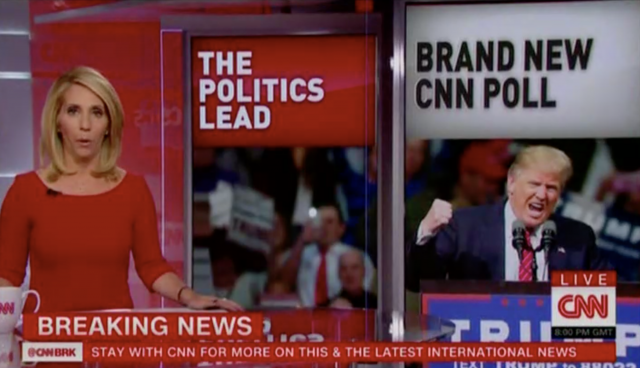 So last night CNN, The Lead with Jake Tapper, here is fill-in Host Dana Bash introducing a report about the results of this new poll. BASH: A brand new CNN poll revealing what Americans think about Donald Trump and how he’s performing on key issues, with some good news for the president. His approval rating ticked up and Americans feel better about the economy today than they have in nearly two decades. MATTINGLY: If you take a look at the top line approval number, the president’s job approval rating is at 42 percent. Disapproval, 51 percent. This’s the lowest share of Americans disapproving that have been polled over the course of his entire presidency. Two months ago, in the middle of the shutdown, he was at 37 percent. Last month at 40 percent. Now at 42 percent. So as you noted, he is starting to tick up. At 42 percent right now. Ronald Reagan, 1983, was at 41 percent. Bill Clinton, 1995, was at 44 percent. You’ll note both of those individuals won their reelection. RUSH: Oh, it’s not good news at CNN. And notice they didn’t tell you what Obama’s number was at this point in his first term. It’s lower than what Trump’s is. Obama’s approval numbers were nothing to write home about. Remember, Obama lost the House with 63 Republican pickups in the midterms of 2010, Tea Party and all that. But the news got even worse when CNN asked people in their poll what they think about the economy. MATTINGLY: Current economic conditions, of those polled, 71 percent say that’s good. Why does that matter? What’s the context there? That is the best number since February of 2001. Obviously, everybody has been talking about the good economy, the president, the president’s advisers want people to talk more about the good economy. Clearly, 71 percent of Americans that were polled saying the economy is good at this moment. Reflecting that, the big question is will that carry over and will that lead to future upticks as well? Why does that matter? Because you guys have been trying to not report it. You’ve been trying to ignore it. You want people to think, even with the headline of your story about the poll, that Trump’s doing horribly, the economy is nothing to write home about, you’re not reporting the food stamp news. They have to report this. Now, to put the cherry on top of this they went Paul Begala who essentially says, don’t worry about any of this, there’s gonna be a recession before the 2020 election, and Trump’s gonna get killed because of it. BEGALA: — as Trump is today, but that’s because they were in the upswing. They’d come in in terrible recessions and then they were starting to boom. We seem to be at the end of a long recovery that hasn’t been as spectacular maybe as some people would like. A 29 point differential. So the economy has been his water wings, just keeping him from drowning. For him, God forbid when we go into a recession, I don’t know what happens, but it will be interesting to see. RUSH: So here we are in the midst of an upticking economy, we have a president doing better, 71% say the economy’s good, it’s the best number on that subject since February of 2001. CNN has to report all this ’cause it’s their poll. They’re shocked, they can’t believe it, they’re trying to attach as much negativity as they can. So they go get The Forehead to start assuring people, don’t worry, don’t worry about this, audience, because we’re gonna have a recession. That’s right. We’re gonna have a recession. We’re in a very, very weak economy right now, which means you people think the economy is doing great, you don’t know what you’re talking about because this economy is no great shakes according to CNN, and we’re gonna have a recession, which means you’re gonna get hurt your economic fortunes are gonna decline and we here at CNN are gonna be applauding that and we’re gonna be encouraging that. We’re gonna be amplify that because that’s gonna then hurt Trump when we go into 2020. What a way to inspire an audience. What a way to acquire and hold an audience, to be the harbinger of doom, to assure your audience that everything’s gonna be okay because the economy’s gonna tank. Now, I have long maintained that the way the Democrats have set themselves up: good news for America is bad news for them, and bad news for America is good news for them, and they are just demonstrating it here again. Don’t worry, viewers. Don’t worry. Your economic fortunes are about tank, and that’s great news! Because that’s then how we’ll get rid of Trump. They’ve tried everything, and then they get this poll? They’ve gotta be demoralized. RUSH: This morning on CNN’s Newsroom, the anchorette/infobabe Poppy Harlow asked the justice correspondent, Jessica Schneider, about a Supreme Court ruling on “detaining immigrants with criminal records.” In other words, the Supreme Court found in favor of the Trump administration on an immigration issue, and CNN just can’t believe it! SCHNEIDER: They came down in a 5-4 vote right along those ideological lines, and liberal justice, uh, Stephen Breyer, he read his dissent from the bench — and that’s something that’s rarely done, except when a justice believes that the majority’s opinion is particularly troubling. The Supreme Court today ruling and really siding with the Trump administration that even if it’s years after the immigrant was released from criminal custody, ICE can, in fact, pick that immigrant up and hold them in detention without bond while their deportation is being considered. So Justice Breyer dissented really vociferously here, saying that this opinion represents a, quote, “serious constitutional problem.” This decision comes at a time when the immigration debate has been raging here the Washington. This particular case [is] really dealing with statutory interpretation here. It’s total common sense! The left is outraged, and this CNN report deals with only one aspect of it, and that’s the dissent by Justice Breyer. They try to feed the appetite of their crazed, radical, leftist audience that has to be fed anti-Trump, anti-Trump, anti-Trump 24/7. But it’s only common sense. And you know how many of these travel ban rulings or other executive actions or orders that Trump has made end up traveling through the court system, get to the Supreme Court, and Trump is upheld. The Trump administration’s always upheld. It’s another teachable moment out there. So it’s been a bad day. I mean, this is only Tuesday. It’s been a bad, bad day for CNN. They’ve got a poll out there that shows Trump’s disapproval number is dropping, meaning his approval number is going up. 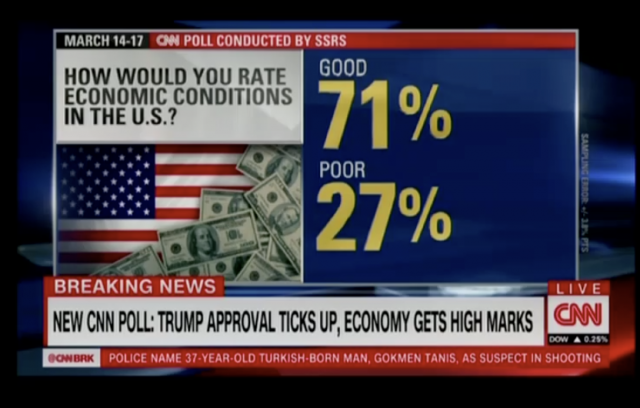 Seventy-one percent of the people in the CNN poll think the economy is doing great. We haven’t had a number like that since 2001. Now the Supreme Court upheld ICE and their wish to detain criminal illegals who are slated for being deported, and the left is just fit to be tied.